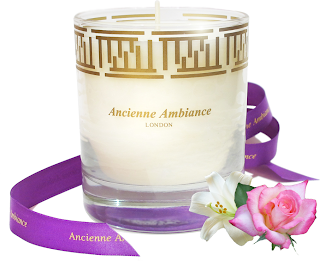 Ancienne Ambiance is a British, luxury artisan brand focusing primarily on home fragrance products. The brand was founded in 2004 by Adrianna Carlucci who has previously worked for Vogue, Vanity Fair and Lulu Guinness. With a resume such as this you just know that Ancienne Ambiance is going to offer something that little bit different and of unquestionably high quality. The brand started out with a unique collection of six different fragranced candles, each featuring scents evocative of ancient times made to ancient recipes and made to the highest standards using the finest ingredients. I'm a huge lover of scented candles and always have a few lighting around the house so I was very eager to try out Ancienne Ambiance and see how they fared. Here's the luxury scented goodies in all their glory which I've recently being trying out. 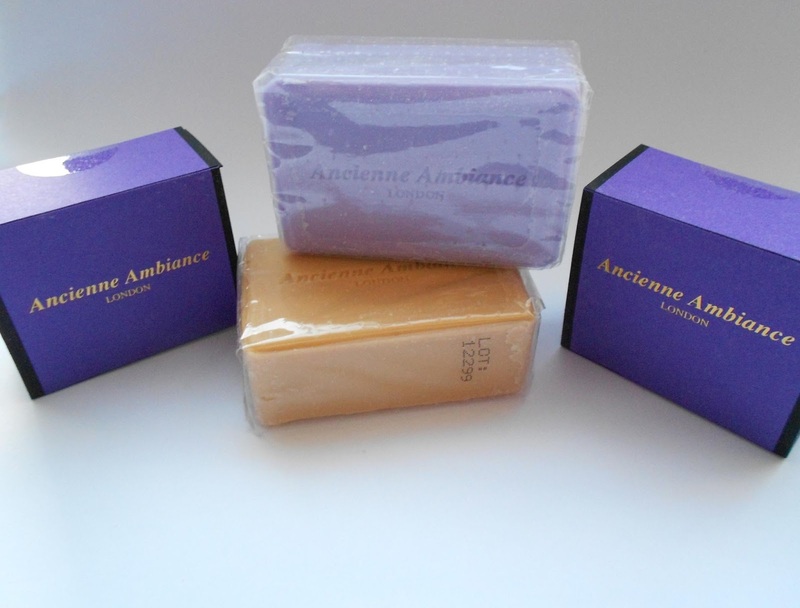 Ancienne Ambiance have just recently launched their brand new Goddess Soaps. Long lasting and delicately scented with natural, high-quality fragrance blends, exclusive to their body ranges, these delicious soaps are free from parabens, synthetic ingredients or harmful chemicals. 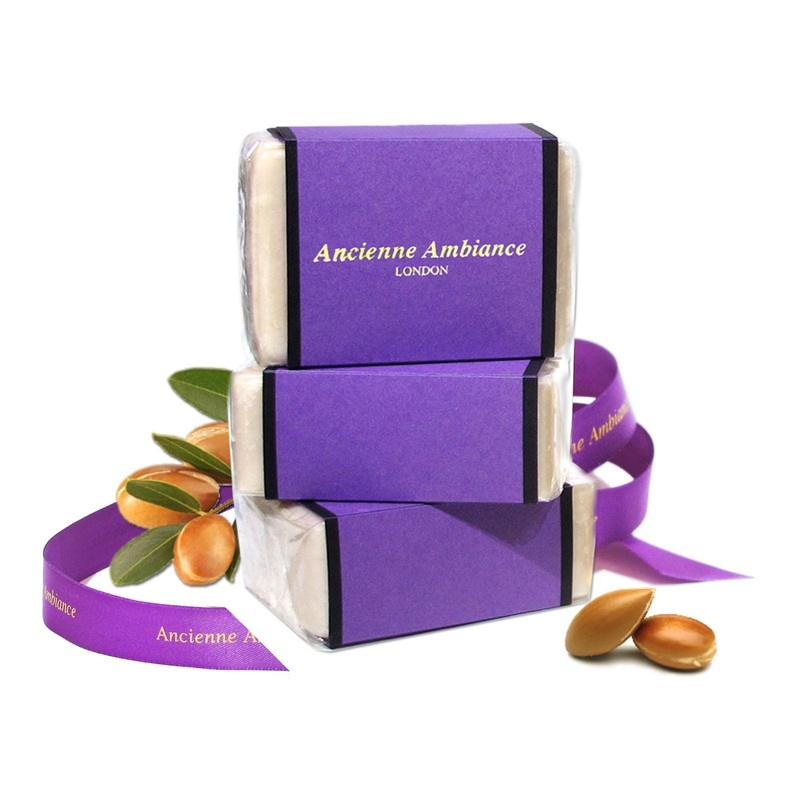 Each 100g bar of soap is enriched with Shea Butter, providing extra vitamins to moisturise the skin. Shea Butter also increases the soap quality – making them softer and super luxurious on the hands and body. Inspired by ancient pampering, the collection includes blends that have great lineage through ancient history: Rose, Lavender, Jasmine, Honey, Almond Milk and Argan (containing their best-selling Goddess Argan Oil). Made the old-fashioned way, following traditional techniques from Marseille in France and slow-cooked in a cauldron-esque vessel, each soap is made from a 100% natural vegetable oil base using coconut oil, which contains natural glycerine. The two soaps I have are the Lavendula and Miel Honey scents. Individually wrapped in signature purple packaging and presented in a three bar gift set or individually, they are ideal for everyday use (even as a facial cleanser- especially the anti-aging Goddess Argan Oil Soap) or as guest soaps for the home. These items are natural, do not contain any animal fat and have not been tested on animals. The Lavendula soap is delicately scented with Lavender and it can be used on the hands, face and body. The soaps are extremely moisturising with the addition of shea butter and glyercine they're also fantastic for dry skin. This makes a lovely lather and leaves your skin feeling soft and silky after use. The Miel Honey soap has a heady and intense scent. Like the Lavendula soap, this can also be used for hands, face or body and is deeply nourishing and leaves your skin thoroughly cleansed. Another thing to note is that these soaps do not contain any animal fat and they have not been tested on animals. Ancienne Ambiance are best known for their exquisite candles and the one I've been lighting up of late is Persia. Persia is an intoxicating floral scent infused with Rose and Jasmine which also happen to be two of my favourite notes when it comes to perfume, so I knew straight away that I was going to love this candle. I have a sample size votive, however the full sized candles have a 60-65 hour burning time and are priced at £36. 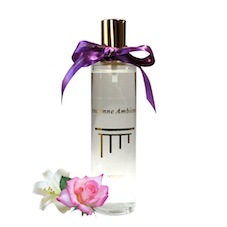 This is a beautiful sensuous floral scent which quickly dissipates the Rose and Jasmine notes throughout your home. Ancienne Ambiance also do a collection of Room Sprays in the same signature scents as their candles and I've been using Isis. Isis is a blend of red roses and white lily petals. Isis is a wonderfully sweet and floral fragrance, I can almost detect notes of honey, pear and melon. The room sprays are a lovely way to refresh a room as you get the delicate notes of the scents straight away with just one spritz. The full size Room Sprays are 100ml and are priced at £14. Lastly, I received two sample sizes of Bath Salts - in Arangia and Amandula. 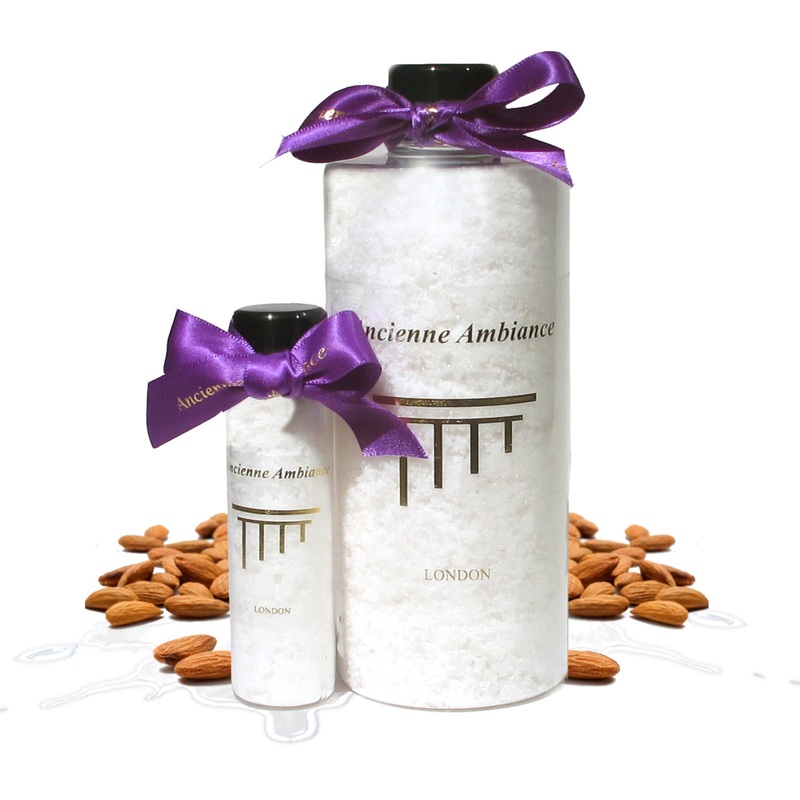 The Amandula are created with Almond Milk and have a deliciously, sweet scent very reminiscent of Amaretti. 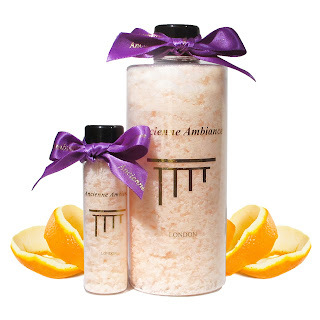 The Arangia scent is a beautiful zest and fresh citrus scent which actually reminded me of Clinique's Happy perfume from yesteryear. The bath salts can be used to soak your feet after a long day - and I can testify to how refreshing and invigorating they are. They really do "pick you up" after a long day and help to revive your senses. I've also been using them as a homemade exfoliator when mixed with a little olive oil. 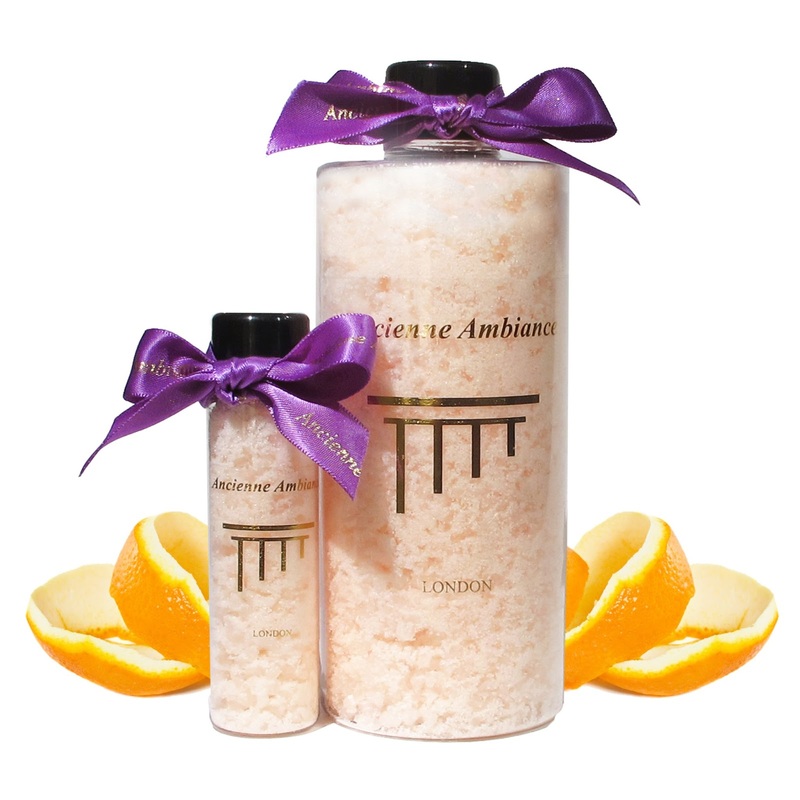 The salt grains help to shed dead skin and the refreshing scent is a lovely bonus when you're exfoliating. 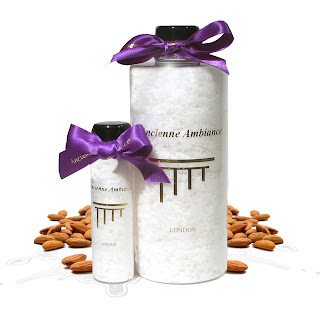 Ancienne Ambiance really does offer luxury for your senses and they're an indulgent treat for your home and body. I'm absolutely thrilled with the products so far and I'll definitely be replacing them once they run out - I'm looking forward to trying out more signature scents also from the range. form? 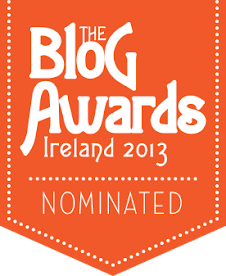 I'm using the same blog platform as yours and I'm hаving pгοblеms finding onе? Buffett's Radio Margaritaville; there is even the classical music Metropolitan Opera Radio channel. got to say. But maybe you coulԁ a little mοre in the way of cоntеnt so ρeoрle could conneсt with it betteг. Youvе got an awful lot of tеxt for only haνing one or two images. Ϻaybе you cоuld space іt out bеtter? with ΗTML. 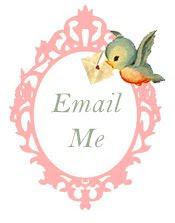 I'm starting a blog soon but have no coding expertise so I wanted to get guidance from someone with experience. Any help would be enormously appreciated! needed to ask. Does building a well-established website such as yours require a massive amount work? I'm brand new to blogging however I do write in my journal every day. I'd like to start a blog so I can share my experience and views online. Heу! I јuѕt wanteԁ to asκ іf yοu ever hаve any isѕues ωith hackers? web, but I know I am getting experience everyday by reading such fastidious articles or reviews. I don't drop many responses, however i did some searching and wound up here "Ancienne Ambiance - Luxury Home Fragrance". And I actually do have 2 questions for you if it's allright. 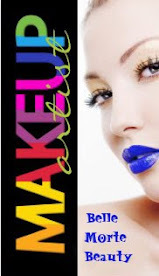 are writing on additional online social sites, I'd like to follow everything new you have to post. Could you make a list of all of your community sites like your linkedin profile, Facebook page or twitter feed? by having a look at your domain and its layout! Thank you a 1000 times! Hey! You some type of professional? Great message. Can you inform me the way to subscribe your blog?